The answer depends on the underlying cause(s), the child’s age, developmental trajectory and skill set at the time of diagnosis, the response to therapies so far, and how they go on to respond to the various treatment regimes. According to the CDC, “Research has found that ASD can sometimes be detected at 18 months or younger. By age 2, a diagnosis by an experienced professional can be considered very reliable. However, many children do not receive a final diagnosis until they are much older. This delay means that children with an ASD might not get the help they need. The earlier an ASD is diagnosed, the sooner treatment services can begin.” The webpage even provides a detailed algorithms for parents and professionals to follow. The site also provides links to the various tools that families and diagnosticians can access. 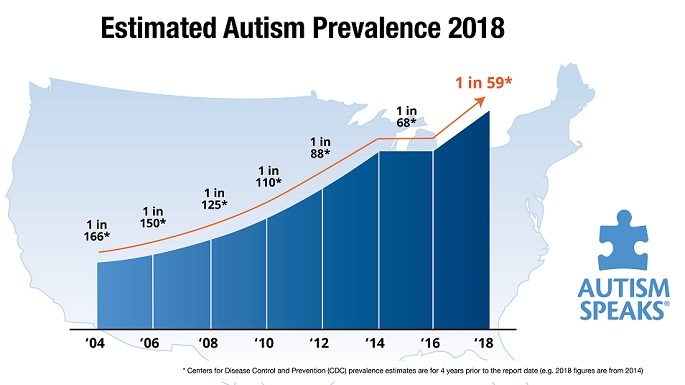 The CDC even displays an Autism Fact – Myth Table, with references, at the bottom of the page. Begging the question, is how accurate the tests are, as far as assessing and predicting the future course of a patient’s autistic involvement. Presently, there are no practical biological markers to measure and follow the ‘level’ of autism. There are certainly tests, such as chromosome and abnormal metabolic laboratory findings, that carry more predictable courses. • Initial score less than 50th% of top possible score. • Scores that are higher in speech. • Scores that are lower in negative behaviors. • Scores that continue to improve over time. The good news is that many of the negative behaviors attributed to autism are often gut-related. As the astute clinician diagnoses and successfully treats that co-morbidity, children often respond with improved communication skills, including the difficult-to-treat speech apraxia problem. Likewise, accurately understanding and treating the lack of interaction with the environment – lifting ‘The Fog’ – with biomedical intervention, goes a long way toward lowering the bad scores and improving the child’s ability to attend to the traditional therapies. Attainment of the skills that are required to join a general education classroom is more important than any score – developmental, intellectual or academic. Perhaps sadly, the non-disruptive and compliant child is more likely to remain mainstreamed than those with more advanced abilities who are aggressive or less-responsive. Finally, I like to point out that the term ‘high’ or ‘low’ functioning doesn’t just apply to the developmentally challenged. There are lots of low-functioning neurotypical individuals. We meet them every day. This entry was posted on Sunday, February 28th, 2016 at 5:31 pm	and is filed under >ALL<, AD/HD, Alternative and Complementary Medicine for ASD, Asperger's Syndrome, Autism Therapies, Chelation, Earliest Red Flags, Gastrointestinal Issue, Genetics, News-Maybe-Worthy, Patient experiences, Reversing autism, Sensory issues, Speech and Language, Vitamin B12, Vitamin D. You can follow any responses to this entry through the RSS 2.0 feed. You can leave a response, or trackback from your own site.